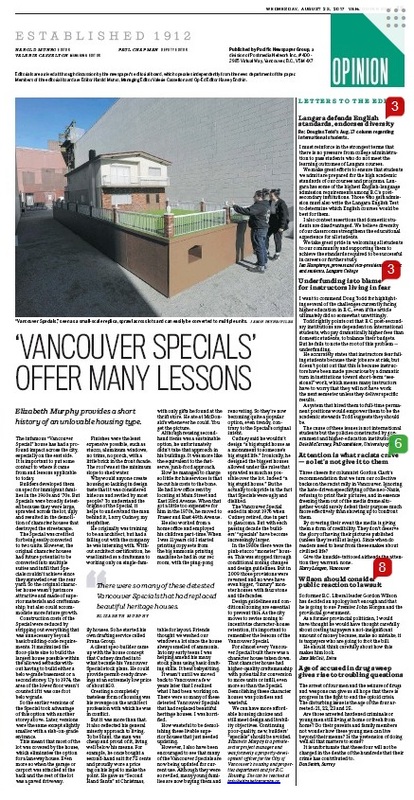 The infamous “Vancouver Special” house has had a profound impact across the city, especially on the east side. It is important to put some context to where it came from and lessons applicable to today. Builders developed them on spec for immigrant families in the 1960s and ’70s. But Specials were broadly detested because they were large, sprawled across the lot, ugly and resulted in the demolition of character houses that destroyed the streetscape. The Special was credited for being easily converted to two units. However, the original character houses had future potential to be converted into multiple suites and infill that Specials couldn’t achieve since they sprawled over the rear yard. So the original character house wasn’t just more attractive and made of superior materials and craftsmanship, but also could accommodate more future growth. Construction costs of the Special were reduced by stripping out everything that was unnecessary beyond basic building-code requirements. It maximized the floor-plate size to build the largest house possible within the allowed setbacks without having to build either a below-grade basement or a second storey. Up to 1974, the area of the lower floor wasn’t counted if it was one foot below grade. So the earlier versions of the Special took advantage of this option with another storey above. Later, versions were the same except slightly smaller with a slab-on-grade entrance. 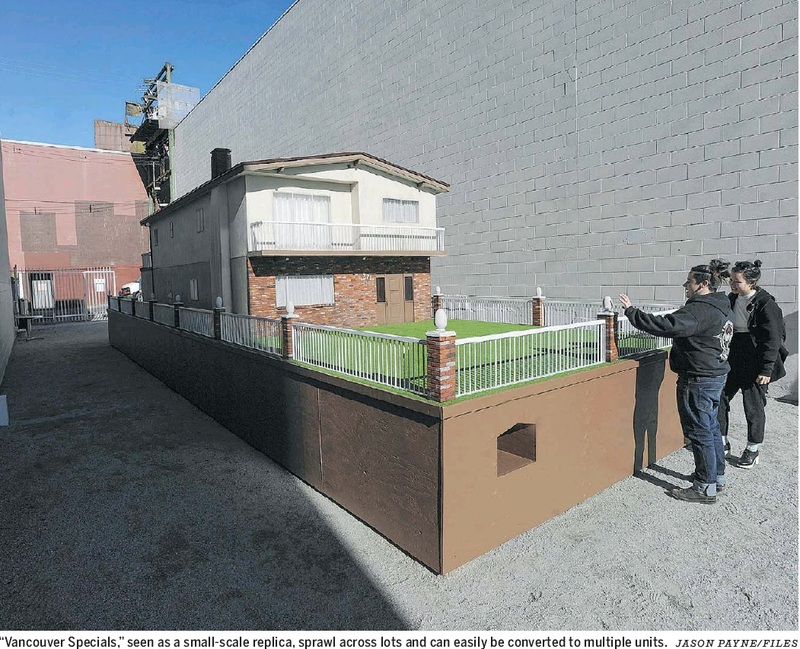 This meant that most of the lot was covered by the house, which eliminates the option for a laneway house. Even more so when the garage or carport was attached at the back and the rest of the lot was a paved driveway. Finishes were the least expensive possible, such as stucco, aluminum windows, no trims, no porch, with a little brick in the front facade. The roof was at the minimum slope to shed water. Why would anyone create housing so lacking in design taste that it was considered hideous and reviled by most people? To understand the origins of the Special, it helps to understand the man behind it, Larry Cudney, my stepfather. He originally was training to be an architect, but had a falling out with the company he was interning with. Without architect certification, he was limited as a draftsman to working only on single-family houses. So he started his own drafting service called Prana Group. A client spec-builder came up with the house concept that Cudney drafted into what became his Vancouver Special stock plans. He could provide permit-ready drawings at an extremely low price of about $50. Creating a completely tasteless form of housing was his revenge on the architect profession with which he was in conflict. But it was more than that. It also reflected his general miserly approach to living. To be blunt, the man was cheap and proud of it, living well below his means. For example, he once bought a second-hand suit for 75 cents and proudly wore a price tag on his lapel to make the point. He gave us “Second Hand Santa” at Christmas, with only gifts he found at the thrift store. He ate at MacDonald’s whenever he could. You get the picture. Although reusing second-hand items was a sustainable option, he unfortunately didn’t take that approach in his buildings. It was more like the equivalent to the fast-serve, junk-food approach. How he managed to charge so little for his services is that he cut his costs to the bone. He had low office rent by locating at Main Street and East 33rd Avenue. 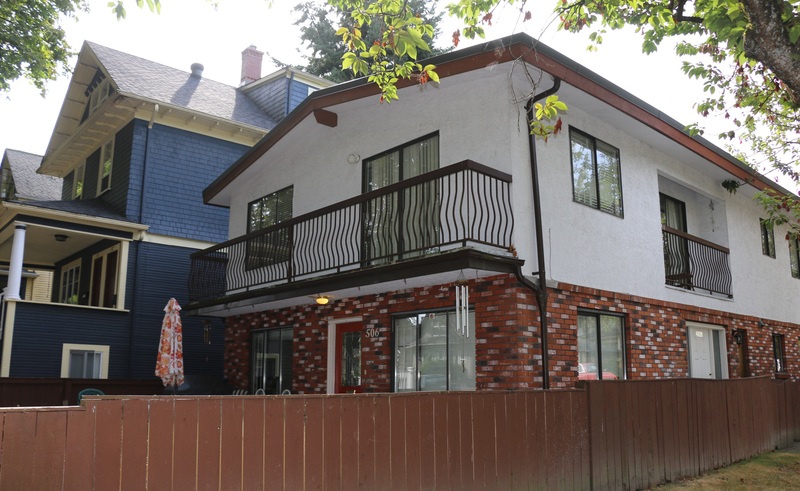 When that got a little too expensive for him in the 1970s, he moved to Fraser and East 49th Avenue. He also worked from a home office and employed his children part-time. When I was 11 years old I started printing copy sets from the big ammonia printing machine he had in our rec room, with the ping-pong table for layout. Friends thought we washed our windows a lot since the house always smelled of ammonia. Into my early teens I was helping amend his many stock plans using basic drafting skills. It beat babysitting. It wasn’t until we moved back to Vancouver a few years later that I realized what I had been working on. There were so many of these detested Vancouver Specials that had replaced beautiful heritage houses. I was horrified. How wasteful to be demolishing these livable superior houses that just needed updating. However, I also have been encouraged to see that many of the Vancouver Specials are now being updated for current use. Although they were so reviled, many young families are now buying them and renovating. So they’re now becoming quite a popular option, even trendy, contrary to the Special’s original intent. Cudney said he wouldn’t design “a big stupid house as a monument to someone’s big stupid life.” Ironically, he designed the biggest houses allowed under the rules that sprawled as much as possible over the lot. Indeed “a big stupid house.” But he actually took pride in the fact that Specials were ugly and disliked. The Vancouver Special ended in about 1976 when Cudney retired, due in part to glaucoma. But with each passing decade the builders’ ‘specials’ have become increasingly larger. In the 1980s there were the pink-stucco “monster” houses. This was stopped through conditional zoning changes and design guidelines. But in 2009 those provisions were reversed and now we have even bigger, “luxury” monster houses with faux stone and tile facades. Design guidelines and conditional zoning are essential to prevent this. As the city moves to revise zoning to incentivize character-house retention, it’s important to remember the lessons of the Vancouver Special. For almost every Vancouver Special built there was a character house taken down. That character house had higher-quality craftsmanship with potential for conversion to more units or infill, even more so than the Special. Demolishing these character houses was pointless and wasteful. We can have more affordable-housing choices and still meet design and livability objectives. Continuing poor-quality, new, builders’ ‘specials’ should be avoided. This entry was posted in Elizabeth Murphy, Vancouver Sun and tagged Affordable Housing, Community Plans, Elizabeth Murphy, Heritage, Vancouver. Bookmark the permalink.